Hellooo, Friday! Today is the last day of Vacation Bible School, so while I am frantically filling 5 gallon jugs of Fruit Punch, you can read some of my favorite posts I found around Blogland this week. And please don't forget to enter the awesome one9designs Giveaway before Sunday at 5 pm! ~If you need a 12 step program for your magazine hoarding, Megan's Magazine Solution might be for you (and me). 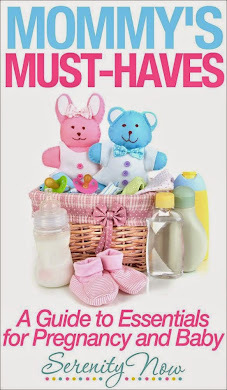 ~Beth is such a fun mama! 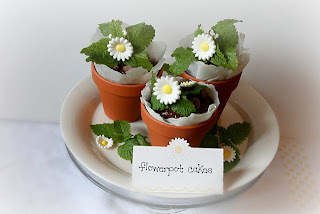 Take a look at her Flowerpot Brownie Cakes! ~If you love Glee as much as I do, you are going to freak out when you read this new blog: What Would Emma Pillsbury Wear?. I linked to a very funny post about the pilot and Emma. ~Designer Blogs shared 4 Things Not to Do to Your Blog. ~Check out Rachelle's Master Bedroom Makeover. ~Victoria showed her readers how she crafted her own "Bon Appetit" Sign. ~Beckie wrote about making her bread do double duty: Uncrustables and Croutons! I'd love to hit a yard sale or two on Saturday. I am desperate to find some plant stands or a metal shelving unit for my deck, but it's SO hot...I don't know if there will be any sales this weekend. We'll definitely spend some time at the pool, and I am halfway through my giant pile of ironing. Maybe I'll treat myself to some ice cream when I finish. 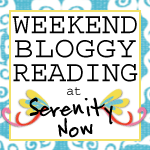 I love your Friday links. My favorite this week is the Emma Pillsbury one. I love how she dresses. Good luck with your plant stand search. It really is hot. Maybe the sales will go on but the crowds will be lighter because of the heat. I need a 12 step program for my magazines, I'll have to check that out for sure... It's becoming a mountain of DIY mags.. opps. ooh..i love Glee! I'll have to check that link out! Thanks!! Have a great weekend...and enjoy that ice cream! I love glee, can't wait to go visit! Have a great weekend! Thanks for these links each week. I alwasy find something good. Love the lamp in the bedroom revamp.